Nanny Poppinz policy is that there are NO, repeat NO, upfront fees or charges of any kind. You only owe the referral fee when you have selected a full or part time Nanny or a commitment has been made for a temporary Nanny. There are 2 parts of paying for the Nanny: the first of which is the Nanny Poppinz referral fee and the second is the actual salary of the Nanny. The referral fee is paid to Nanny Poppinz and the salary is paid directly to the Nanny. Temporary Nannies are paid in cash. Please remember that Nanny Poppinz is open 24 hours per day and if you have hired a full or part time Nanny you also have Nanny Poppinz back up care which provides referral free replacement Nannies. 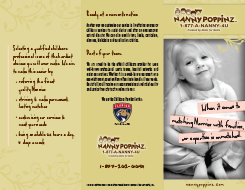 All of the Nanny Poppinz services are customized to your specific requirements regardless of their complexity.